One thing about living in Atlantic Canada - the weather is rarely dull. Bob Hope once quipped on a visit to Nova Scotia that it was the only place he'd ever been that he experienced all four seasons in one day, and it's been said, "If you don't like the weather, wait an hour or two." Not far off the mark. In the past week here in Nova Scotia, we've had temperatures in the high 60s and in the teens, Fahrenheit. And while we had our first major winter storm over a month ago, winter officially arrived on Sunday with a major blizzard packing hurricane-force gusts and knocking out power for some 100,000 homes, which translates to about one-quarter to one-third of the province's population in the dark. Here on the eastern mainland coast, we got off relatively lightly, so to speak. The wind last night howled like an enraged wild animal, and it went on and on and on, but we didn't get a whole lot of snow, and the power at my house managed to hang in through the worst of the storm with a few flickers and momentary cutouts. It finally succumbed around noon on Monday. This once more gave me occasion to thank myself for using laptop computers. The power came back on here after about nine hours, although the wait for restoration for some is estimated for late Tuesday evening, which is a long time to go without power in December with temperatures well below freezing. I just transferred my current work-in-progress and email files to one of my Pismo PowerBooks, which share three FastMac and Newer Technology extended life batteries, each of which can squeeze more than five hours out of a full battery charge. I was working on one of the Pismos when the power went off and didn't even notice until I hit a light switch. The laptop just quietly shifts to running on battery power without a hiccup. Indeed, it would be more convenient if a little alarm chime or some such would sound when the power shift happens. I used up about 15% of a battery charge before I realized it and turned the screen brightness down a few notches. We're reasonably well fixed for such exigencies on this property. We heat primarily with wood, and both of our stoves are electricity-independent. We also have gravity-fed water from an artesian spring, so we can wash, the toilets keep flushing, and we're warm and able to cook food and heat water on the wood stove. And as long as the phone lines aren't affected by an outage, we can still get on the Internet, which is one reason among many that I would no longer seriously consider a desktop computer of any sort as a workhorse machine. When the power cuts out, the portables instantly shift to battery power, preserving any unsaved work and allowing you to finish up whatever you were doing gracefully. The same kind of security and ability to carry on computing with a desktop machine would require a really big (and expensive) uninterruptible power supply (UPS) unit, which also would add another layer of complication and clutter - and cancel out the price advantage of using a desktop machine. On the other hand, you can keep a laptop computer going for a couple of days on its internal battery if you ration your use, especially if you have one of the new, extended life replacement batteries that are available. With a laptop, a cheap power inverter, and a car battery, you should be able to ride out even a lengthy power interruptions if you have a means of periodically recharging the battery - I can recharge my batteries if I need more than 15 hours or so. After a major November storm a few years back, I bought a 700 amp rechargeable power pack, which has an automobile cigarette-lighter type socket into which will 12 volt items, such as my Kensington 70 watt Auto Air power adapter (unfortunately now discontinued) can be plugged. I also have a little 300 amp power inverter that converts 12 volts DC (i.e. : a car battery) into 120 volts AC, but I prefer to use the Kensington device, because the inverter itself draws a fair bit of charge. Running a laptop computer with this setup involves stepping 12 volts DC up to 110 volts AC, and then back down to 24 volts DC with the laptop's AC adapter - not a very efficient process. Another deficiency of the power pack is that its little 1.5 amp internal trickle charger takes about 36 hours to charge the pack if it's fully depleted. You can charge it faster by hooking at up to a higher amperage charger or to a running automobile, but the manual says that will shorten its life if done often. Something I've found extremely useful during power blackouts is RadTech's I-Sight ear-worn personal illuminator. The I-Sight's overdriven, super-bright Nichea LED module features a parabolic reflector and precision focusing lens to provide an amazingly bright and uniform beam pattern, with no hotspots - just pure and even lighting. The manufacturer claims up to one mile visibility - and it certainly is very bright. 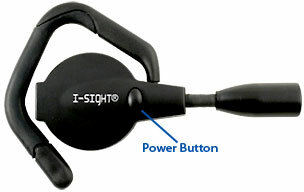 I-Sight's reversible and adjustable ear loop allows use with or without glasses on left or right ears. The I-Sight provides a keyboard lighting solution if you have no other general light source, but it really comes into its own when you need to wander through the house, or even outdoors, looking for things or just getting on with the necessities of life. Weighing just 18 grams and featuring a claimed useable, continuous runtime of over 36 hours, I-Sight illuminates the wearer's field of vision with no distracting side flare while keeping both hands free. An easy-to-use push-button power switch, aimable lamp module on a flexible stalk, and tool-less battery replacement round out the feature array. The I-Sight illuminates whatever you look at, not just a portion of the keyboard. This may be a positive or negative characteristic, depending on your needs and circumstances. If you want a keyboard illuminator in order to avoid disturbing someone trying to sleep or watching TV in low light in the same room, you may find the I-Sight too bright. Some flashlights are a lot dimmer. The I-Sight's beam is quite focused, but there is some scatter from the glow. On the other hand, if you just need to light up your work space, it does a fine job. You won't have any trouble seeing the keys. However, USB powered keyboard lights have an edge here, never needing battery replacement. On the other hand, the USB lights eat up precious battery charge. Replacement batteries for the I-Sight cost about six to eight dollars. The I-Sight is default configured to be worn on the right ear, but it can be quickly converted for left ear use, and is it compatible with eyeglasses and Bluetooth headsets. It works fine with my wire rimmed specs. Speaking of USB-powered keyboard lights, I also have a LapWorks USB Nite Key Lite - an 18" long serpentine keyboard lamp with two white LEDs that does a fine job of lighting the keyboard for non-touch typists like me, albeit at the aforementioned charge life penalty. The Nite Key Lite plugs into and draws power from one of your 'Book's USB ports - but not necessarily a whole lot of power. LapWorks says that the Nite Key Lite's power consumption amounts to roughly 90 seconds per hour of battery life on average. The bulbless LED units have a projected service life of up to 8,000 hours. It comes with a lifetime warranty and sells for $14.95. The RadTech I-Sight is available from RadTech, Amazon.com, Cyberguys, Power Max, and other dealers. 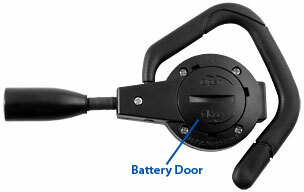 The LapWorks USB Nite Key Lite is available directly from LapWorks.